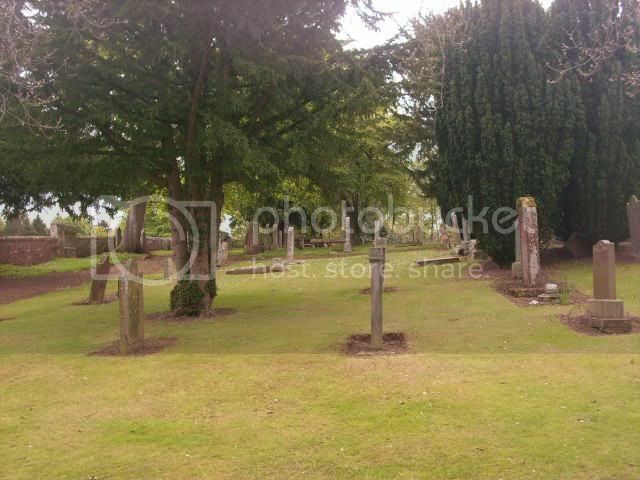 There are 5 CWGC stones within Whittingehame Churchyard, 2 from WWI and 3 from WWII. 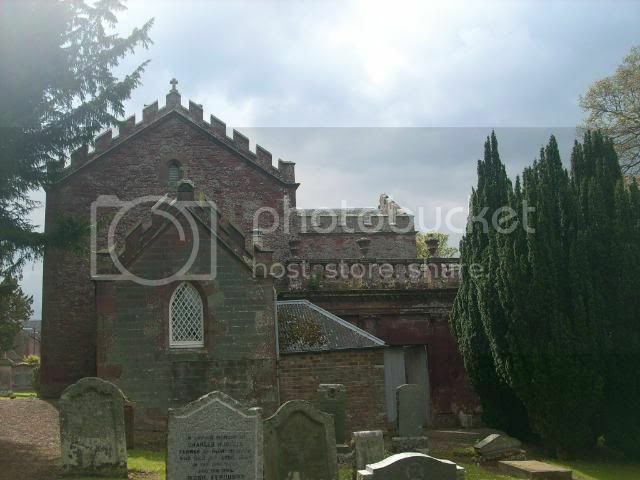 Whittingehame Church stands in remotest rural East Lothian a mile west of Stenton and 2½ miles south of East Linton. 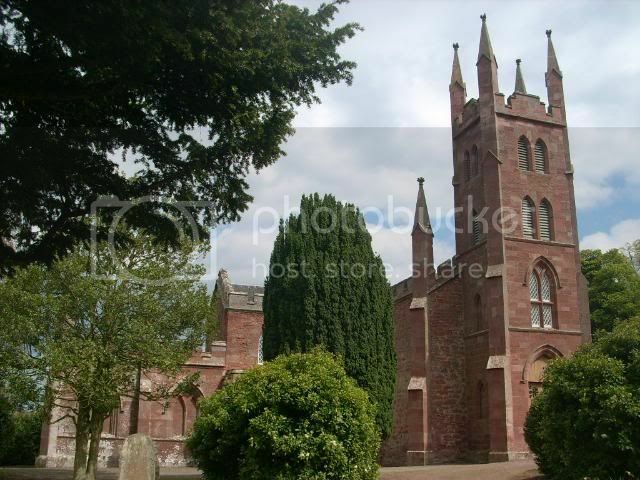 What you find is a pinnacled and battlemented Gothic church in red sandstone with a tower at its west end. Christianity in Whittingehame has ancient origins. The first church in the area was established by St Cuthbert in the 660s, during one of "The Apostle of the Lothians" missionary expeditions north from his base on Lindisfarne. This appears to have been built, probably of wood, on a site in nearby Luggate. No trace has ever been found, but the field name "Kirklands" is thought to indicate the site. 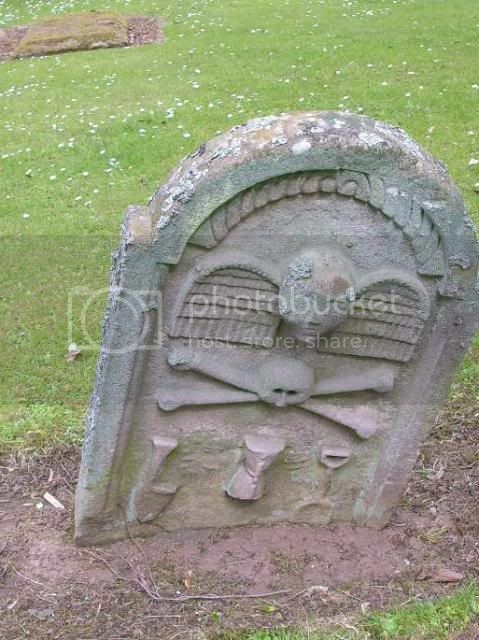 In 1225 the first stone church at Whittingehame was built. It is unclear whether this was a replacement for an existing church at Luggate, or whether all trace of St Cuthbert's church and its successors had already disappeared. Either way, the site chosen in 1225 was much nearer Whittingehame Castle and was on or fairly near the site of the church you see today. The church was formally dedicated by the Bishop of St Andrews on 7 May 1245. It had probably been in service for some time previously: dedication by the Bishop was as much a statement of control over existing churches as a celebration of new ones. The medieval church seems to have survived the Reformation in 1560, but by 1721 the Minister, the Rev James Glen, was reporting it to be in a very poor state of repair. A new church was built in 1722. This continued to use the bell, cast in 1610, of its predecessor, and it also inherited two silver communion cups which had been purchased by the old church in 1683 for £120 Scots. As originally built, the new church had no seats. These were fitted in 1739. The Whittingehame Estate was purchased by James Balfour in 1817. 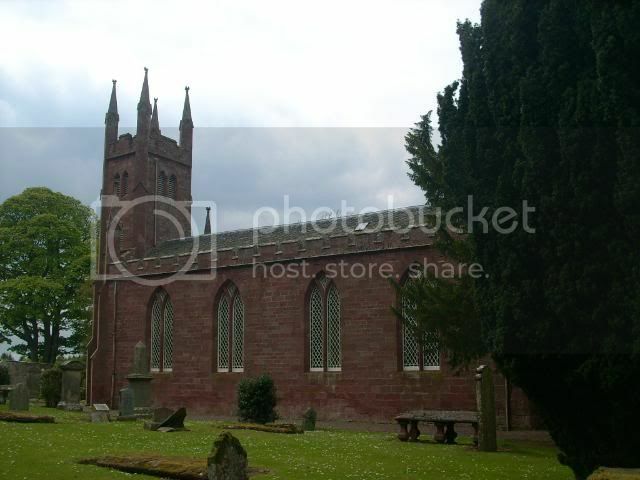 After building Whittingehame House he turned his attention to the church. The result is variously described as a renovation, an enlargement, or a rebuilding, depending on the source you use. It seems reasonable to say that the core of the structure of the church you see today dates back to 1722, but the detail and the tower owe more to the work undertaken in 1820. More renovation and refurbishment took place in 1857 and 1875. The pulpit, communion table, font and lectern were presented to the church in 1912 by Miss Alice Balfour. Its depth of history adds greatly to the charm of a visit to Whittingehame Church. 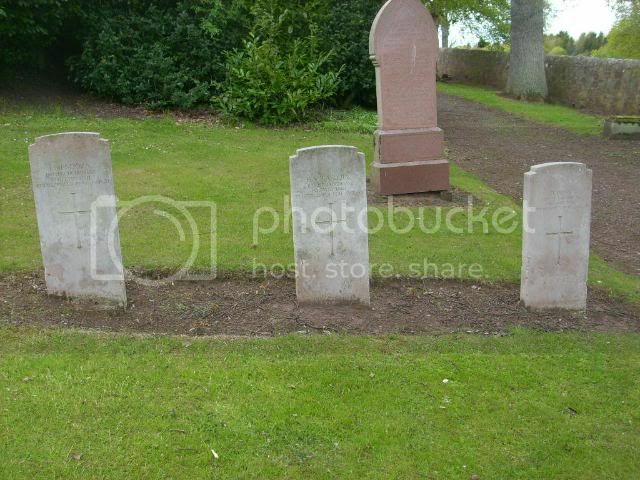 There are a number of old gravestones on view in the graveyard, and the burial aisles on the north side of the church give the building an intriguing shape. Perhaps the most arresting aspect of the exterior is a porch in the north west angle of the church, which for all the world looks as if was deliberately built leaning forward, away from the church. Once inside, the church reveals itself to have a T-plan with, as usual, the pulpit in the middle of the south wall. 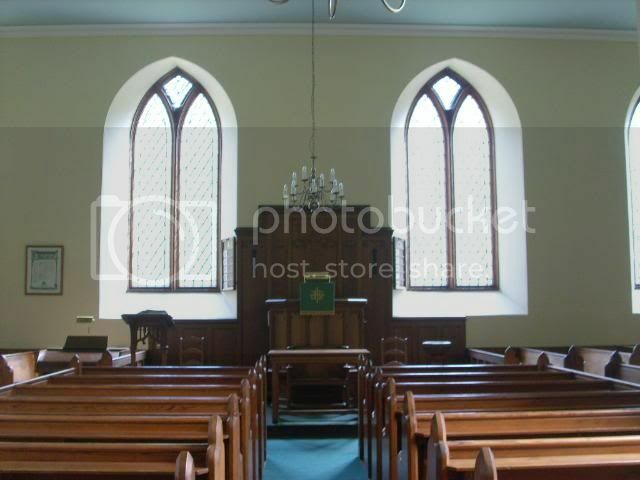 It feels rather less austere than many churches of this style, perhaps because of the warm colours of the woodwork. 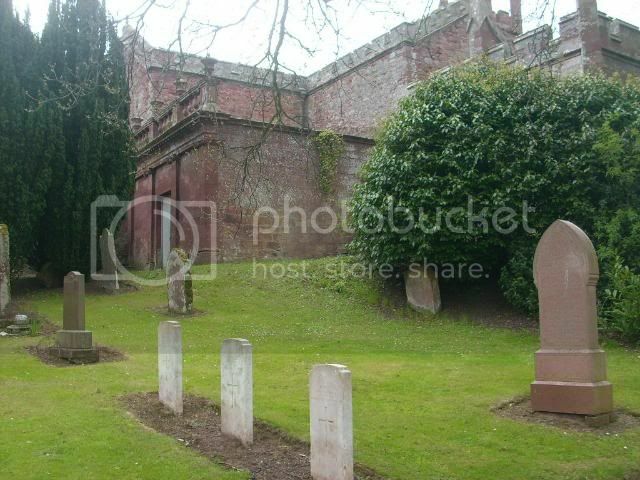 At the end of the north arm of the church are three memorials, two of which remember Whittingehame's most famous son, Arthur Balfour, who is buried in the family aisle here. Arthur Balfour was the grandson of the James Balfour who purchased the estate in 1817. He served as Prime Minister from 1902 to 1905. As Foreign Secretary during the First World War he issued the "Balfour Declaration" which would later lead to the establishment of a Jewish homeland in Palestine. Less well known was his 1918 confirmation that the United Kingdom acknowledged the statehood of Latvia. Grave/Memorial Reference: D. K. In South-East part. 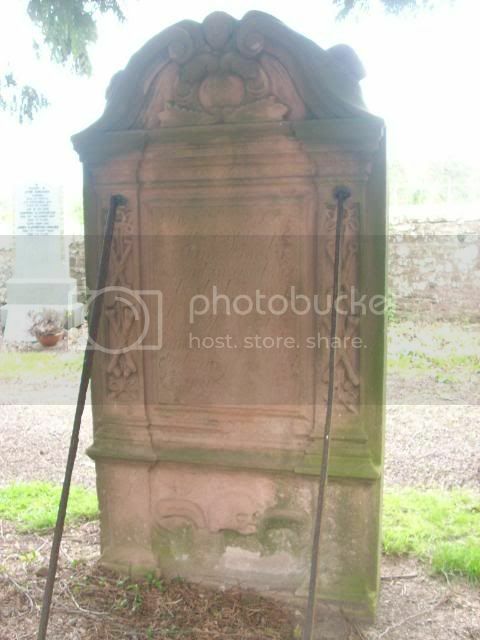 Additional information: Son of Mrs. Catherine Smith, of 23, High St., Dunbar, East Lothian. Grave/Memorial Reference: A. D. In North-West part. 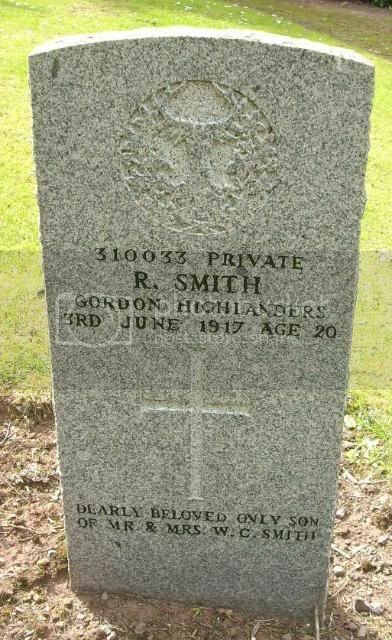 310033 Pte R Smith Gordon Highlanders 3rd June 1917 aged 20. Dearly beloved only son of Mr and Mrs W C Smith. There are 3 CWGC from WWII. 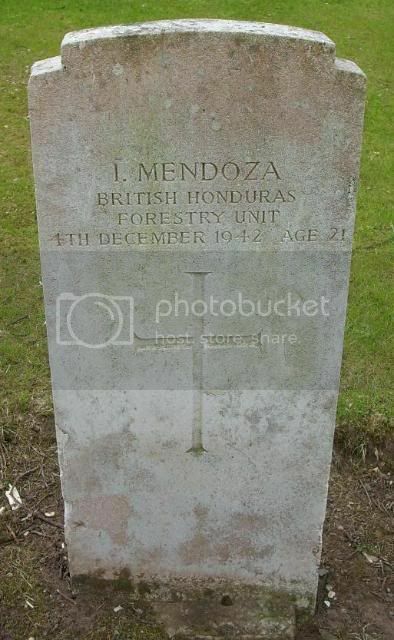 They are for 3 men who came to Scotland as part of the British Honduras Forestry Unit. 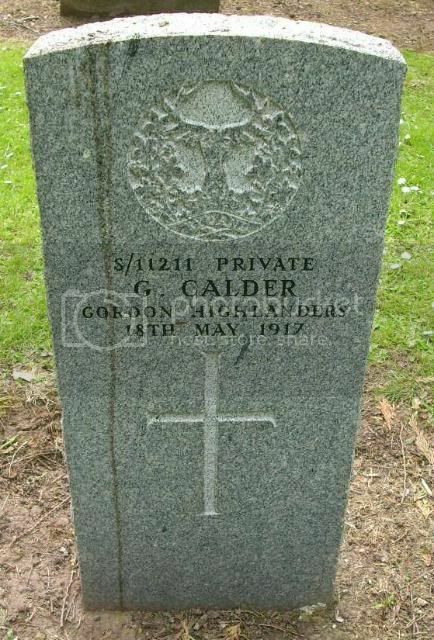 They are comemorated on stones similar in style to CWGC stones, however they are not named on the CWGC website. The 3 British Honduras Forestry Unit stones. 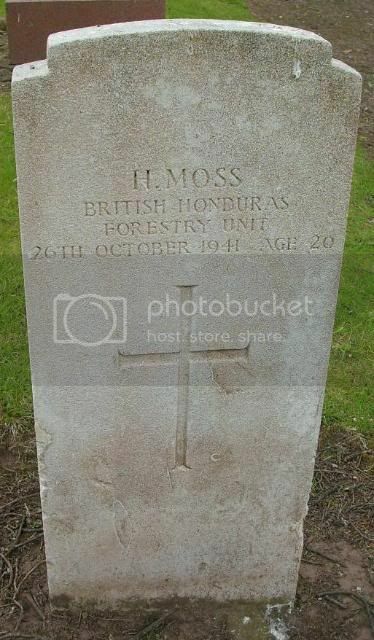 H Moss British Honduras Forestry Unit 26th Oct 1941 aged 20. 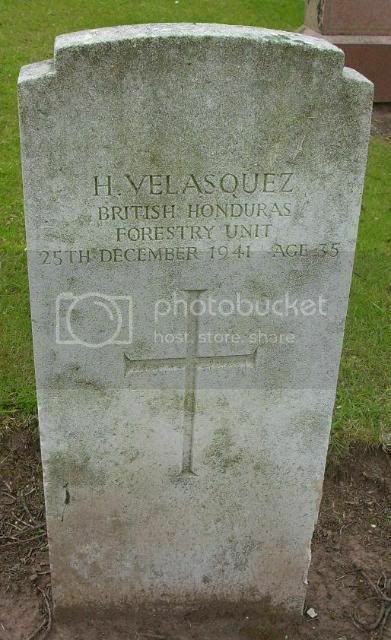 It would appear that H Moss and H Velasquez had only been in Scotland for a few weeks/months before they died. Additional information: Son of Mr. A. Gray, of Whittinghame Home Farm, Prestonkirk. East Lothian. 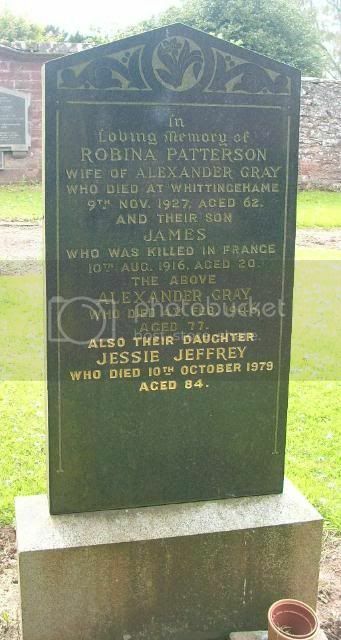 In loving memory of Robina Patterson wife of Alexander Gray who died at Whittingehame 9th Nov 1927 aged 62 and their son James who was killed in France 10th Aug 1916 aged 20 the above Alexander Gray who died 4th Feb 1946 aged 77 also their daughter Jessie Jeffrey who died 10th Oct 1979 aged 84. 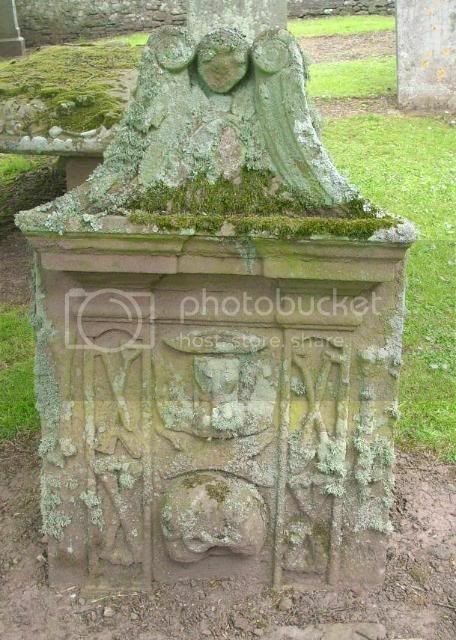 Additional information: Son of Mr. and Mrs. Charles Russell, of West Mains, Haddington. 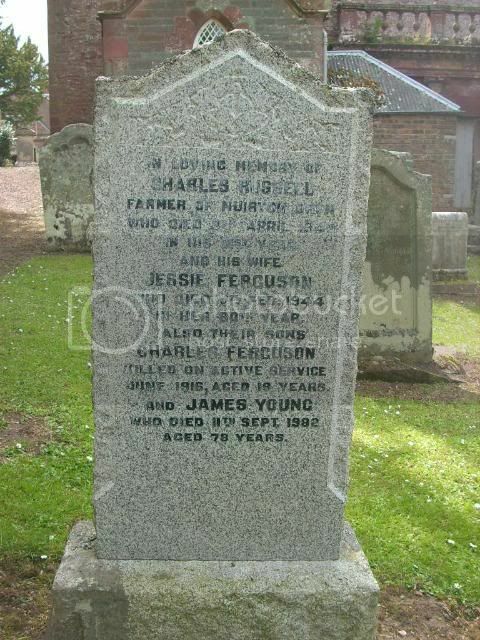 In loving memory of Charles Russell Farmer of Muirton, Drem who died 8th April 1940 in his 81st year and his wife Jessie Ferguson who died 10th Feb 1944 in her 80th year also their sons Charles Ferguson killed on Active Service June 1916 aged 19 and James Young who died 11th Sept 1982 aged 78. 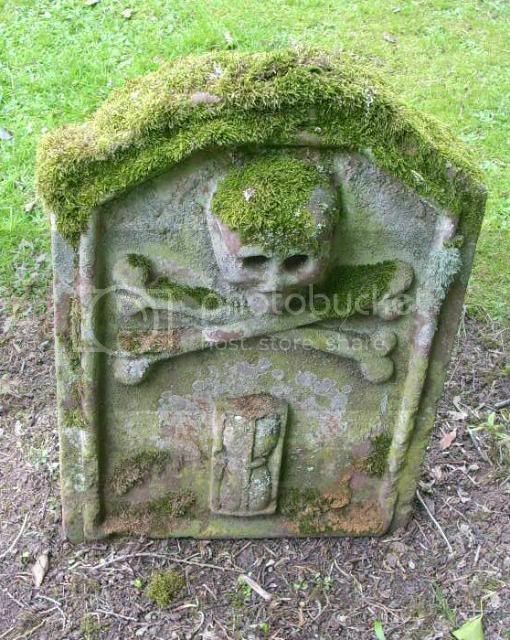 Some interesting old stones found in the Churchyard.